But there are some amazing facts that most people don’t realise until they visit. Did you know, for instance, that only 5 percent of land in Hong Kong is developed? Or that 65 percent of Hong Kong is national parkland? 7.2 million people live in less than 1,100 square kilometres (425 square miles). Over 500,000 vehicles drive on less than 2,000 kilometres (1243 miles) of road. To this extraordinary place and people, we introduced the extraordinary Tesla Roadster in 2010. 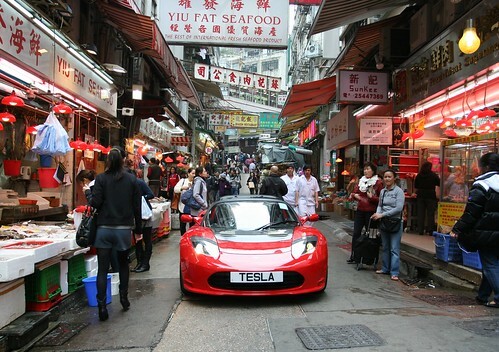 The people of Hong Kong love their cars and they’ve welcomed the Roadster with open arms. 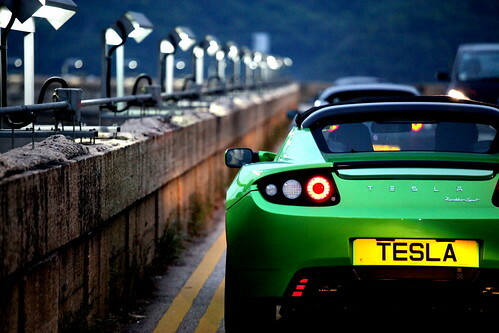 Air pollution is on the rise in Hong Kong and EVs are highly anticipated. Of course, there are the standard EV myths that need busting here, as anywhere else in the world. But boy, does the Roadster bust them in style! The Government is very supportive of the introduction of electric vehicles. The homologation process for a new vehicle is normally about ten to 12 weeks, but they expedited the Roadster, completing the approval process in only a fraction of that time. The government has also worked to develop electric vehicle purchasing incentives similar to those in other forward-looking nations. For example, people who purchase EVs in Hong Kong do not pay First Registration Tax (FRT) and the annual license fee is significantly reduced for electric vehicles. There is also a movement toward the development of charging infrastructure; the Secretary of the Environment Edward Yau has publicly stated that he wants to install 1,000 charging stations in both government and private car parks by the end of this year. That proactive approach contrasts sharply with other governments in the region. The mountainous terrain in Hong Kong really shows off the car’s performance. The torque of the electric motor helps the Roadster remain fast and powerful on the steepest of sections. Its mid-range acceleration cannot be beat. 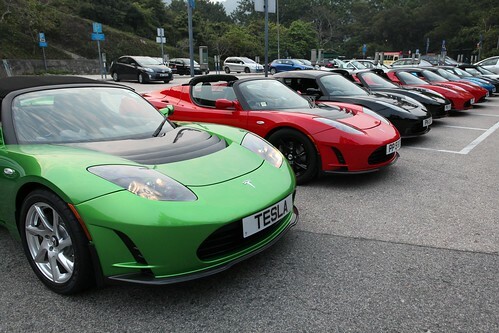 Many of Tesla’s first customers in Hong Kong fell in love with the Roadster on Garden Road. Philip Ma, one of the first owners, recently decided to found a Tesla owners club. On March 26, the members held their first event: an evening drive and dinner. 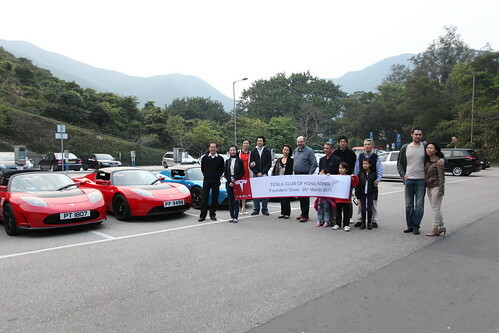 The drive started with a gathering and photo shoot at Big Wave Bay. Ten Roadsters and two owners waiting patiently to take delivery were present. Our resident photographer (and sales manager), Kenneth Lui, took the stunning photos that you see here. After our all-too-short drive, we arrived at The Repulse Bay - an old, colonial-style hotel remodeled into an upmarket apartment complex with superb shopping and dining facilities. We dined with a soft sea breeze ruffling our hair as the sun set over the 200-plus islands of the Hong Kong archipelago. Including spouses, children, and the Tesla team, over 30 people enjoyed the experience. To formalise the club, the first annual meeting was held. Philip Ma was elected President, Philip Liang Vice President, and Mark Webb-Johnson webmaster. Tesla’s own Jessie Zhang was elected as membership coordinator and Tesla liaison. 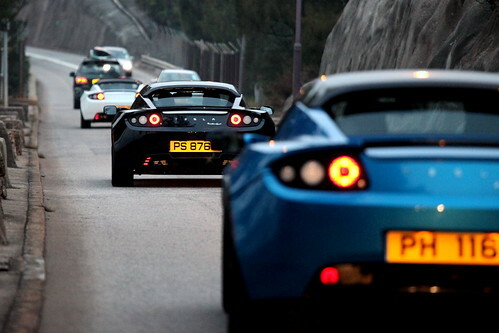 That night, we set a Hong Kong record: 11 Tesla Roadsters in one place, at one time. That record won’t last long. Quite a few new cars are en route, with their owners waiting anxiously to take delivery. It’s official, Hong Kong is going electric!